Contemporary colors and designs jump off the page with screenprinted Lokta origami paper featuring a hive of busy black bees against a bright yellow background. Nepalese paper artisans hand-craft Lokta paper out of fibers from the bark of the Lokta bush and then silkscreen eye-catching designs onto the sheet. Temporarily Out of Stock - Type "YES" to confirm and your order will ship out when available. 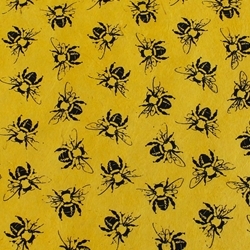 Inspired by nature, the Bees design features a swarm of bees in basic black on an eco-friendly, bright yellow base color of this hand-made Nepalese Lokta Origami Paper. Lokta Papers are acid-free and weigh approximately 45 to 60 gsm for a moderate weight. The handmade paper lends itself to a multitude of origami and art projects.